If you live someplace where the weather is still pretty warm in November, Beth has created a cute Thanksgiving Day dessert that will be perfect for your celebration. 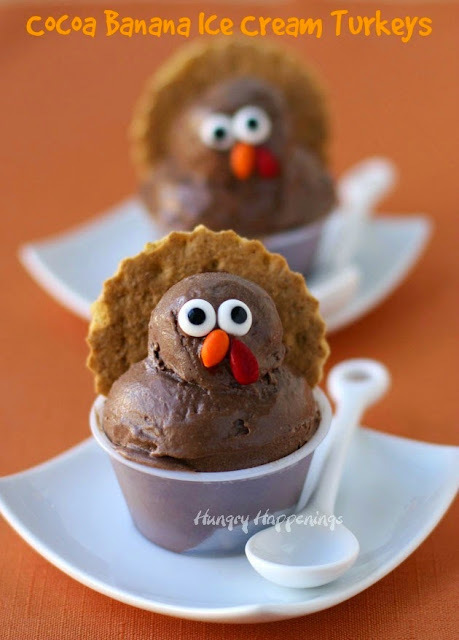 And to make it even better, these ice cream turkeys are made with homemade cocoa banana ice cream, so there is no added sugar! We love made ice cream from bananas a dozen time, so I give you my word that you will love this ice cream...unless you hate bananas. You can check out how to turn ice cream into a cute ice cream turkey Thanksgiving dessert over at Hungry Happenings.